If there's one thing the team at Moon Dog loves as much as beer, it's dogs. There's one in the brewery name, usually at least one hanging around the brewery, heaps of them in various events they sponsor and, now, a whole series of IPAs dedicated to them. Well, to the brewery dogs specifically. 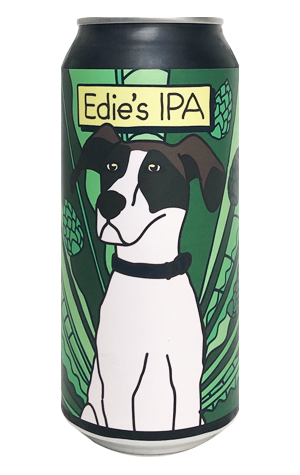 Edie is the first to get both name and visage on a tinnie, one the label declares as "bursting with Eureka, Centennial and Citra hops". That said, don't go expecting a burst of juiciness as tends to be the way these days. Instead, I'd put the beer closer to an English IPA in character; sure, there's a little pine and resin in there, but the hop character is gentle and aromatically more of a peach / stone fruit nature, while the experience is as much about the tight, biscuity malt character and slow-building earthy bitterness.